By AD83 the Romans in Caledonia held a line of glen-blocking forts, (now known as the Gask Ridge forts, from Glasgow to Perth) and the three active legions, XXth, IXth and IInd, were split along this defensive line. Calgacus was one of a number of first century Pictish barons; part of a landed class in northern Celt society with access to slaves, money, men and arms. He fixed on the plan to unify the Caledonian Celtic tribes against Rome. Once Calgacus’ lover, Eirbrin has been sent north to her family lands on the Gleann Mor above Inbhir Nis. Fanatical dedication to the fight to free Caledonia from Rome has been her only way to deal with the deep and disabling shames of her past. When she meets Antony she believes she has found a mystic, a man of power who can help her to overcome the demons of guilt and shame. He is a spy, a Natione - native Britons conscripted to the Roman auxiliary army - used extensively by Agricola in the Caledonian wars, where the Celt’s guerrilla tactics and harsh terrain made success near to impossible. Everything about him should warn Brin of his deception, but her longing to atone, her need to be free of shame, and her growing desire for him allow her to deny or justify any doubts that come. To him, she should be no more than an enemy; and with her ties to the leader of the Picts, a formidable source of information. But as they move through the Caledonian midlands toward the gathering battle, her beauty and courage, her innocence and the unfaltering faith she places in him draw him into an impossible situation. Trapped between an irresistible love and an immovable duty, he must find a way to untangle his web of lies, or return to a life of service, to live or die alone. Caledonia has not been tagged yet. 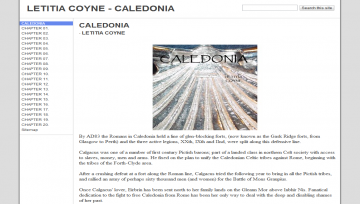 Help others find Caledonia by tagging it! Caledonia has not been reviewed yet. Caledonia has not been recommended yet.